Citing industry sources, the Taiwanese hit-or-miss news site claims Apple will introduce the full-sized iPad 5 in September as scheduled, whereas the iPad mini has no ETA yet, as it will receive further upgrades in terms of tech specs. The fifth-generation iPad won’t sport any significant upgrades in terms of tech specs — we don’t exactly know what they are referring to exactly – but Digitimes reinforces earlier rumours of iPad mini-like slimmer bezels for the 9.7-inch tablet. Since upstream suppliers have mostly finished preparing for the production of the new 9.7-inch iPad, there is unlikely to be any changes in terms of specifications for the device. In addition to the Retina Display, the new tablet features a slimmer bezel design to allow a bigger viewing area, while the number of LED tubes used for the device has been reduced from two to one, and battery longevity is also improved. 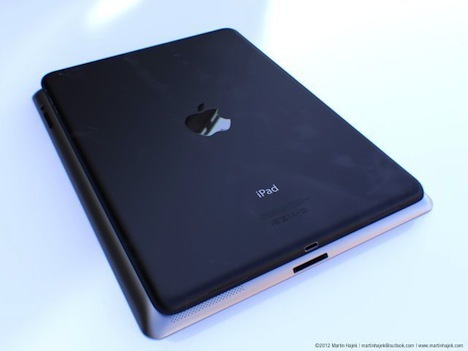 The design change has been rumoured to be arriving ever since the launch of the iPad mini and its successful design. We have already seen a couple of iPad 5 component leaks and even a video posted by the Vietnamese Tinhte.vn showing an iPad 5 case, which hints at a much slimmer and lighter tablet than the currently available iPad 4. One interesting fact, though, is that Digitimes‘ sources note that none of the suppliers have yet received a firm mass-production schedule from Apple, despite the estimated launch being September, and even though they are shipping products for pilot production only. Digitimes also claims that Apple is yet undecided on whether or not to use a Retina Display with the iPad mini 2 alongside a bezel-less design change, similar to that of Samsung and HTC phablets.